A recent report identified Dallas and Houston as having among the highest pension shortfalls among local governments in the country. HOUSTON — The state’s largest cities face tens of billions of dollars in unfunded liabilities to employee pension funds, a series of separate financial situations that is spurring massive account withdrawals, ongoing lawsuits, mounting political friction and national media attention. Austin, Dallas, Houston and San Antonio collectively face $22.6 billion worth of pension fund shortfalls, according to a new report from credit rating and financial analysis firm Moody’s. That company analyzed the nation’s most debt-burdened local governments and ranked them based on how big the looming pension shortfalls are compared to the annual revenues on which each entity operates. “Rapid growth in unfunded pension liabilities over the past 10 years has transformed local governments' balance sheet burdens to historically high levels,” the report says. Chicago had the most dire ratio on the national list. Dallas came in second. According to the report, the North Texas city has unfunded pension liabilities totaling $7.6 billion. That’s more than five times the size of the city’s 2015 operating revenues. Houston, which came in fourth, faces a $10 billion shortfall, according to the report. That amount is more than four times that city’s annual operating revenues. Both those cities may turn to the public to partially shore up their shortfalls. Houston Mayor Sylvester Turner wants to use $1 billion in bonds to infuse that city's funds. Dallas police officer and firefighter pension officials also want $1 billion from City Hall, an amount officials there say is too high. A new Moody's report calculates the unfunded pension liabilities of the U.S local governments with the largest amounts of debt. Four of the top 15 cities are in Texas. Meanwhile, Austin ranked 14th on the Moody’s list with unfunded pension liabilities of $2.7 billion. San Antonio ranked 22nd with a $2.3 billion shortfall. The firm used a complex actuarial formula that it considers proprietary to analyze the long-term financial situations of the nation’s 50 local governmental entities with the highest amounts of debt. Entities included cities, counties, water districts and school districts. Even though many governmental entities find themselves in similar situations, varying state laws, local politics and the unique structuring of individual funds have led them down different paths to reach these current points. However, there could be some common contributing factors. The recession hit several public pension funds especially hard. To shore up ailing budgets during those years, many government entities stopped or reduced their contributions to pension funds, worsening financial problems. Meanwhile, some funds overestimated growth rates, which compounded the situation even more. Moody’s applied its uniform analyses and formulas to the myriad governmental entities so consistent comparisons could be made. But the firm’s process also resulted in different shortfall amounts than government agencies may estimate themselves. One reason for the differences is that Moody’s used each funds' recent growth rates to estimate future fund balances, while many governmental entities estimate their funds will draw higher growth rates in the future. 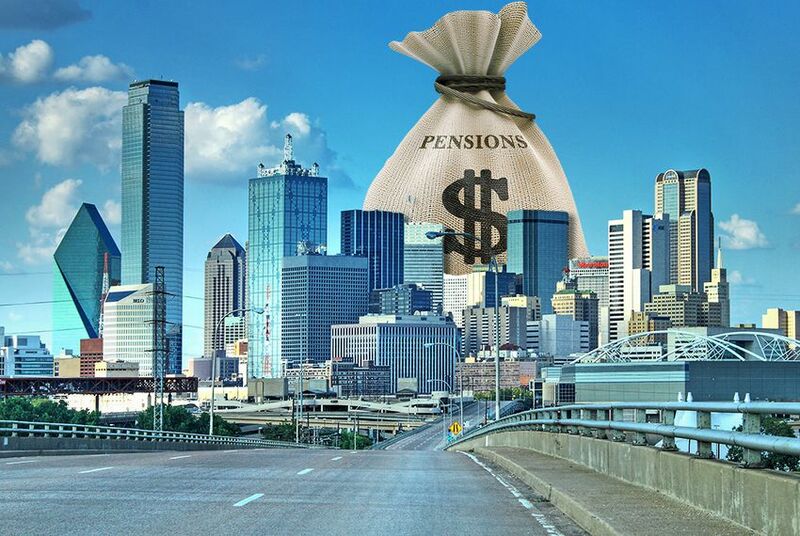 The report concluded that both Dallas and Houston in 2015 likely exacerbated their pension problems because they each contributed less to their funds than what was needed to keep the shortfalls from growing. Moody’s also downgraded the credit rating for both Dallas and Houston to AA3 earlier this year. Unfunded pension liabilities was a primary driver in Dallas’ downgrade, whose outlook was also revised to negative. The pension shortfall was only part of the problem in Houston, where “weakening economic and financial performance driven by prolonged decreases in oil prices” largely prompted the downgrade. Despite projected pension shortfalls, Austin and San Antonio maintain AAA ratings from Moody’s. Dallas’ police officer and firefighter retirement fund has long been plagued with problems. It lost $196 million in 2014 in “risky real estate investments” during a “disastrous plunge into speculative development ventures” that included luxury properties in Napa County, Calif., and Hawaii, according to The Dallas Morning News. The fund’s top staffer resigned amid growing concerns about how the fund was managed. The fund sued its advisers, who were also served with a search warrant from the FBI. But investments are not the sole source of the funds’ woes. Dallas Mayor Mike Rawlings this week called for a halt to lump-sum withdrawals from the fund, following what some viewed as a "run on the bank" situation. A litany of investigations and reports in the Morning News has kept the ordeal in the public spotlight for years. But the situation garnered heightened attention in recent weeks when the New York Times published an article about Rawlings’ testimony to state leaders that the shortfall could bankrupt the city. The “optics aren’t good” for the state if one of its biggest cities has such a fiscal crisis, said Lauren Willis, spokeswoman for Texas Comptroller Glenn Hegar's office. But that doesn’t mean further woes in Dallas will financially impact the state. “There’s not a way for it to affect the state’s credit rating because it’s not on the state’s balance sheet," Willis said. And while Rawlings warned of bankruptcy — and the city’s credit was downgraded this year — that doesn’t necessarily mean the city is headed for an immediate cliff. Like a mortgage, pension fund liabilities don’t come due all at once. Rawlings said that bankruptcy is not imminent and would likely remain a threat only if benefits aren't cut and financial holes go unfilled. A judge on Friday allowed a vote on benefit cuts to go forward. "Our focus right now is to salvage the [pension funds] for our police officers and firefighters," Rawlings said. "We will come together with a plan, but it will require shared sacrifice from active police and fire, retirees and taxpayers." In Houston, Mayor Sylvester Turner recently oversaw a pension reform package that will have to head to the legislature for approval and also would partially rely on $1 billion in bonds to solve the problem. “The deal would eliminate Houston's nearly $8 billion pension under-funding in 30 years, assume more realistic investment returns, avoid $2.5 billion in future costs through benefit cuts, and narrow the funding gap still left after those cuts by issuing $1 billion in bonds,” the Houston Chronicle reported. Thousands of retired Texas state workers are essentially stuck in 2001. Despite rising costs for health care, food and pretty much everything else, their monthly pension checks haven’t budged. Back in 2011, then-Gov. Rick Perry officially retired so he could start collecting his lucrative pension benefits early while still collecting his salary.